Happy Friday! In the Toronto area we are now rejoicing over temperatures of -2 to -10 degrees Celsius. It's practically balmy compared to what we have experienced for the last couple of weeks. Unfortunately The Weather Network is telling us we should be "bracing for heavy weekend snow." Awesome. That being the case, I will continue to focus on indoor pursuits, as I have been for, oh, maybe three months. This week, I took to moving things around the house. 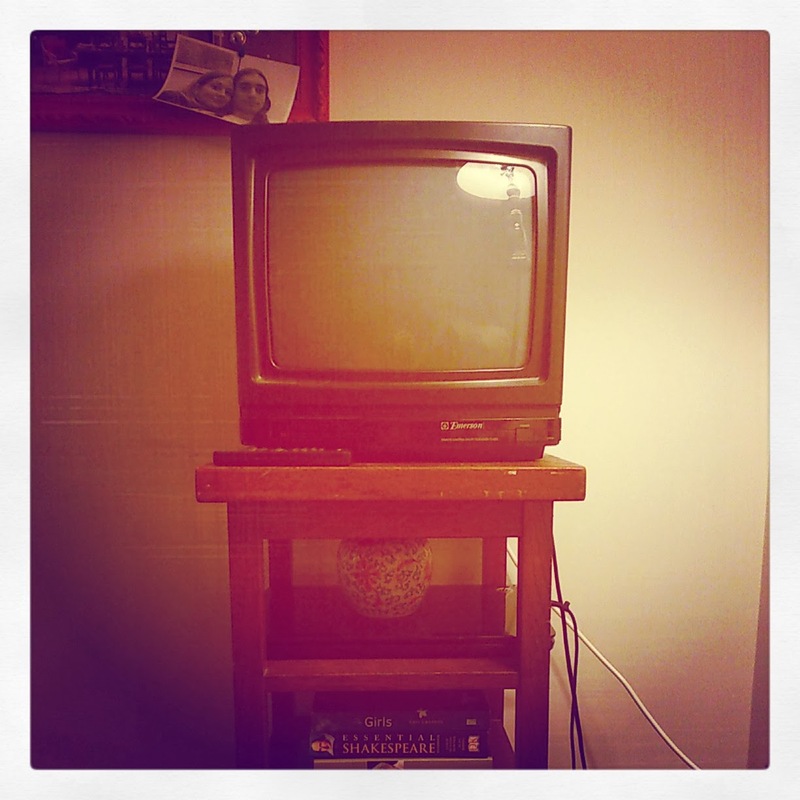 We have this little TV that I got as a teen. It's been sitting unused, so I decided to add it to my living room/office. I placed it atop a vintage table that came from my parents. As I said on Instagram, I must be turning into my dad. He held onto all of his vintage televisions for many, many years. You know the kind that look like big pieces of furniture? He even used one as a base for a more modern TV. 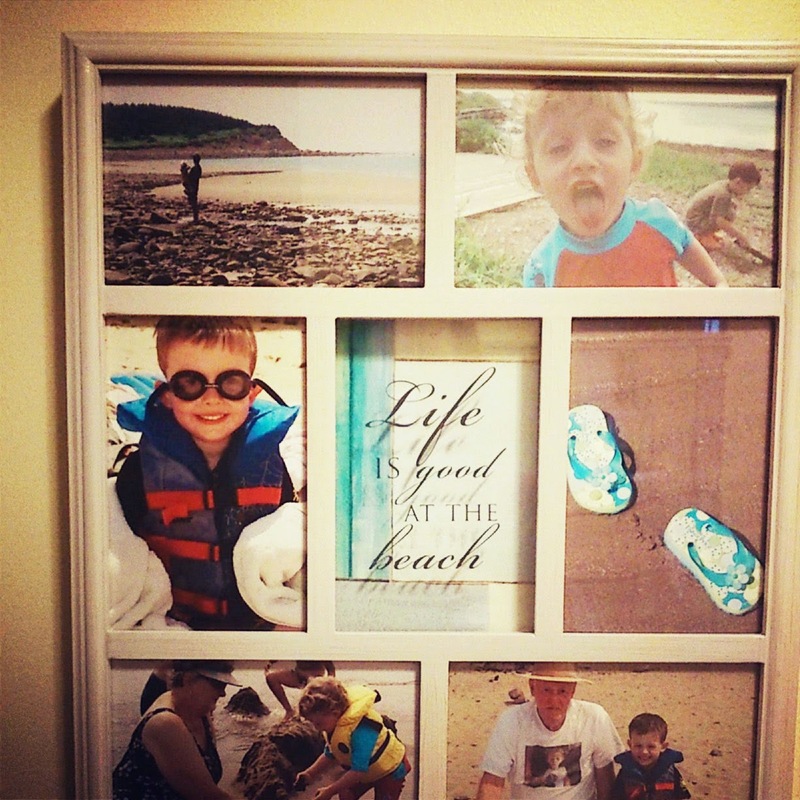 Today, I stood and stared longingly at these pictures of our family vacationing at the beach in Nova Scotia one summer. Seeing as summer is a long way off, I found a way to display some sand that we got from a Cape Cod beach a couple of years ago. It had been sitting in a plastic container, without a home. 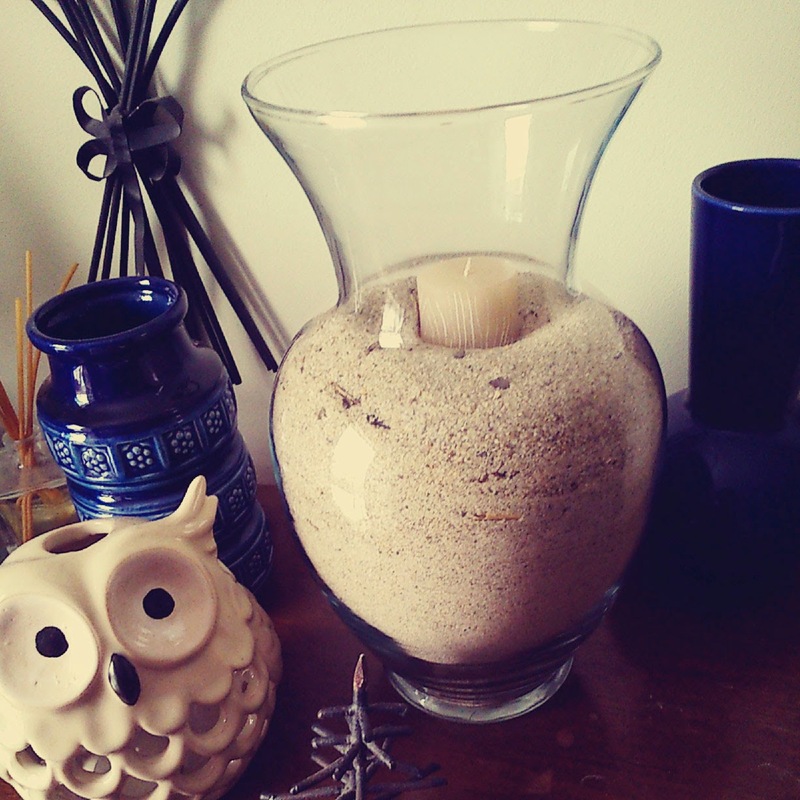 Recognizing that the key to organizing is ensuring every item has a home, I figured it was time to do something with all that sand! Now I can stare wistfully at it. I also organized my office this week, in preparation for tax time. I am down to only one nasty little box of assorted crap that I still need to discard or find homes for. File folders are my friends. I bought a box of 200 at Costco. It seemed ridiculous at the time, but now I am loving them. Recipes, exercise tips (ha! ), receipts, insurance papers - everything gets its own folder! This is one of those rare times when I actually managed to clean both sides of the home office/living room. Usually, I shuffle a bunch of stuff from one side to the other. I have placed our handy little Crosley record player in the corner so I can spin old vinyl while I work. It makes filing papers less dull. 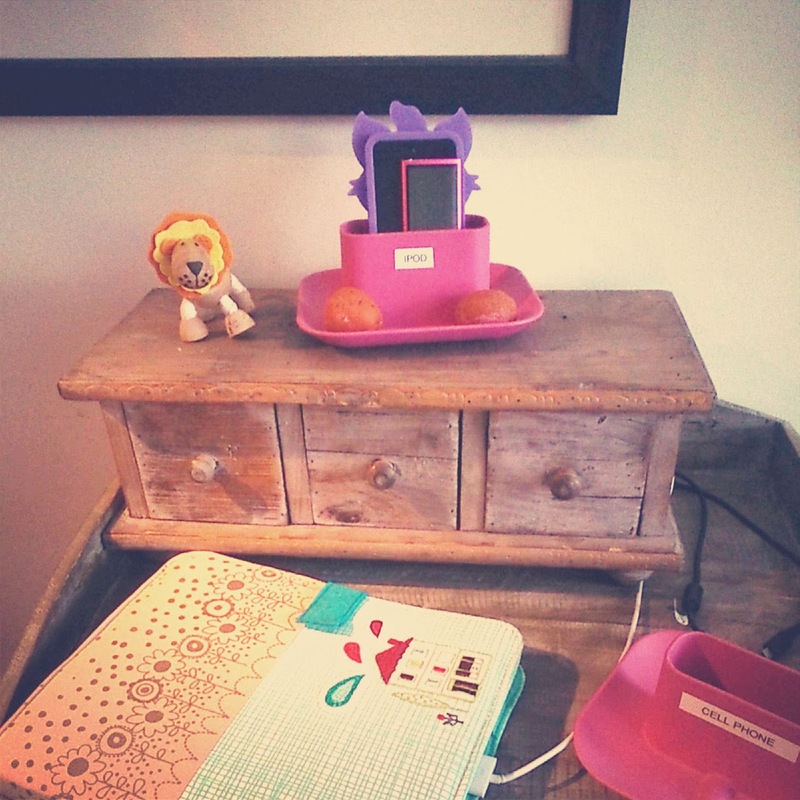 Beside my desk, I have re-purposed a little wooden table to act as our family charging station. Thanks to my mom and dad, the kids and I got iPads for Christmas. Add those to our collection of iPods and cell phones and we needed a proper place to plug in. Otherwise, the kids are constantly moving end tables to get to the electrical outlets. Something is sure to get broken that way. If you like my cute ecojot iPad cover, be sure to enter to win $35 to spend at ecojot.com. How about you? Are you embracing the outdoors or spending more time getting to know your home lately? I saw that TV pic on your Instagram this morning. LOVE! I got a laugh about your father hoarding televisions. He didn't find it so funny. I wonder why? There are still 3 downstairs. One is beautiful wood. Do you want to repurpose them? I love your little instagram glimpses into your house! We had a week of snow days down here too (well the kids did, we had two days with the campus closed)-- though the negative temps were only in the morning. Today we got to 35 degrees and I swear it felt like summer...Nothing like you all are experiencing. Hang tough!! Thanks Taby! I will hang in. ;) Have a fabulous weekend! ooh be careful about the one final nasty little box of crap to file away. In my experience it just doesn't seem to move, it stays there and gathers more crap around it! I made the mistake once of having one big storage tub that I labelled "crap to put away later". I still had it there three years later, I emptied half of it a few months ago and the tub has again been covered up with lots of crap! I will be careful. :) I have had many of boxes like this, and yes, crap attracts more crap. Old cell phones, bandaids, passwords, phone numbers, loose coins, recipes scrawled on sheets of paper - it's all in this little box. I have been going through it for 10 or 20 minutes every day - it's incredible how long it takes! I'm NOT going to put it in the basement, because I'll never look at it again! I gotten bitten by the bug to do some serious organization these past few weeks too! Although not everything has a home...living in an apartment that is half of a120 year old row house means NO STORAGE. Ugh, Im racking my brain for solutions! Happy organizing! I have got the reorganizing bug as well,... and in a BIG way !!! 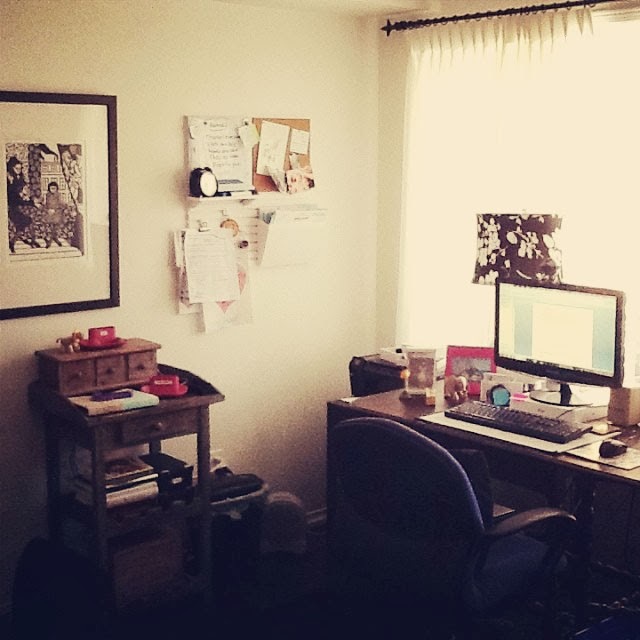 I have just spent the past week reorganizing my home office, and it was every bit as invigorating as it was exhausting. I am hoping for an inspiring space for blogging, crafting, and yes, even tax preparation for 2014.
sitting here by my window watching more and more snow fall.. it's been fall for 9 hours straight now.. I'm jealous of all your organizing... can you come do my house next? And also, my taxes? Stay warm, friend. I wish we were near enough to help each other. Organizing in pairs must be much nicer. ;) Isn't tax time awful? 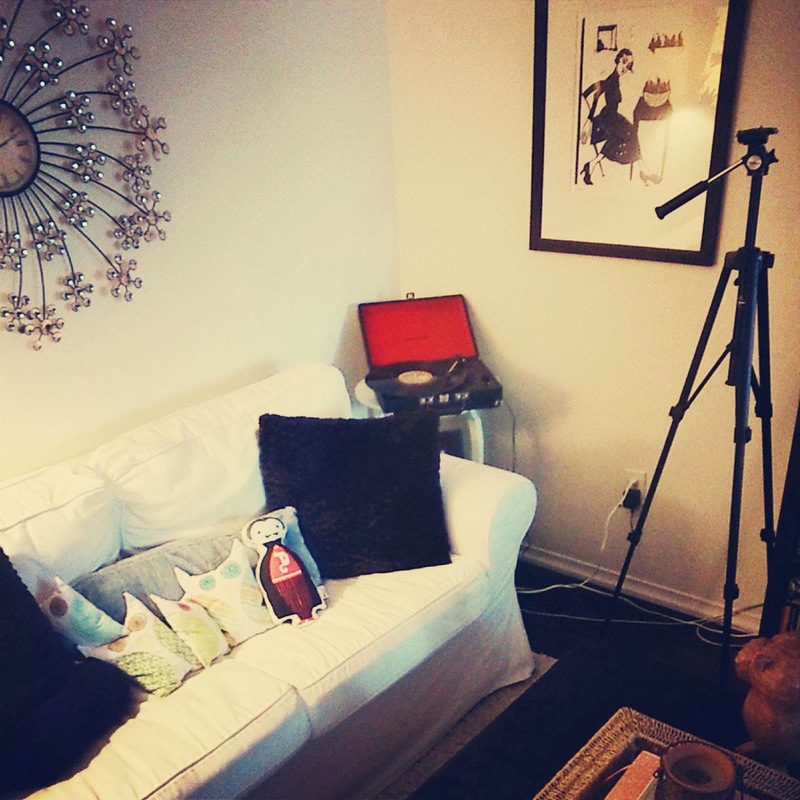 Ahhh, I like how cozy your office is, Joann♥♥♥ And that old TV looks even more vintagy thru the Instagram filter - great photo artwork! I love your office! :) Love that you listen to records while doing your thing- I bet there is some great music going off!